Although best known by the general public for its cosmetic uses, Botox® is used as a treatment for a number of medical ailments. Botox® is a neurotoxin isolated from Clostridium botulinum. It is used primarily as a neuromodulator -- a chemical that inhibits a nerve impulse -- to treat everything from muscle spasms to compulsive sweating. It remains the most potent neuromodulator known to date. Raynaud’s Syndrome is an autoimmune disorder that causes some areas of the body, such as fingers, toes and ears, to feel numb and cool in response to cold temperatures or stress. 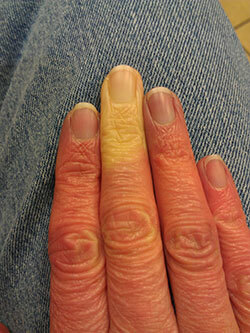 In Raynaud's syndrome, smaller arteries that supply blood to the skin narrow, limiting blood circulation to affected areas. The condition can arise independently or be associated with diseases such as Lupus, Scleroderma or Sjogren’s Syndrome. Botox® has been used successfully to combat the condition with one round of treatment providing relief for up to three months. Plantar Fasciitis is an inflammation of the thick tissue on the bottom of the foot. It is especially common in athletes who perform repetitive motions involving running, jumping and short or quick stops. The injury is also common in people who spend a considerable amount of time on their feet. Studies have shown that Botox® both reduces pain and improves patients’ future ability to walk without discomfort. Nocturnal Bruxism, otherwise known as nighttime teeth grinding, is a condition that affects up to 15% of people. The condition, which damages teeth and is associated with headaches, jaw pain and sometimes TMJ has no standard treatment. Dental guards are often prescribed to patients to protect their teeth, but the devices do not stop the grinding itself. Botox® injections in the temple and the jaw alleviate the condition by blocking nerve signals to the muscles, thus relaxing them. Certain types of non-traumatic brain injuries such as severe alcoholism or medication side effects can cause this problem 24 hours a day. Some patients with cerebral palsy or mental retardation can also suffer from nocturnal bruxism.